On internet and in different cooking books you can find recipes for cashew yoghurt. A great alternative if you want to cut milk products in your diet and still enjoy creamy yoghurt. The recipe below I have borrowed from a lovely Swedish blog called Nillas kitchen. It is such a great blog with al gluten- and very often also lactose free recipes. If you are able to read in Swedish, please head over there to enjoy her blog! But back to the yoghurt. It is a very simple recipe, the only thing you need is some time and patience. After that you can enjoy the creamy (and very healthy) yoghurt for up to 5 days as long as you keep it cold and well covered. To go with the yoghurt, I have prepared a very easy sugar-free granola with cardamom. I also like to add some fresh or warm defrosted berries. If you don’t bother about the sugar, some maple syrup is delicious to go with it. The beautiful bowl for my yoghurt, I have had as a gift from my dear friend Frank. The bowl, from the tableware Troja is made around 1960 for Rörstrands by Carl Harry Stålhane. Such a beauty! Makes about 8 servings, you eat less than normal yogurt. It is so filling! 1.Soak the cashew nuts for at least 5 hours (preferably overnight, it gives better results) at room temperature. 2. Drain and mix the nuts with fresh, lukewarm water (37-40 ° C) for 3 to 5 minutes in a preferably high-speed blender. If you don’t have that kind of mixer, you might want to first mix the nuts in your kitchen mixer and then later pour it over in a high mixer bowl and mix it further with a hand blender. This will give the real smooth result you are looking for. 3. If necessary, adjust the consistency with a little extra water. Carefully add a little at a time so that the consistency does not become too loose. 4. Add probiotic (open the capsule and sprinkle the powder). Mix together. 5. Pour the yoghurt in a clean bowl and cover with plastic wrap. Let the bowl rest for about 24 hours in room temperature. Taste the yogurt, is it sour enough? If not, cover it again and let the bowl rest for another 12 hours in room temperature. Makes a rather small batch enough for 15-20 small servings. Store dry in a tin can or glass bowl with a lid. 2. Prepare a baking tray with a greaseproof paper. Measure the pumpkin, sunflower and the sesame seeds and place them on the tray. Chop the cashew nuts and almonds in a suitable bitesize. Place everything on a the tray. Mix it with your hands. 3. Melt the coconut oil and mix it with warm water and 3 drips of vanilla extract. Spread the mix equal over the nuts and seeds and work with your hands to cover everything with the oil and water. Spread the granola in a thin, equal layer on the tray. 4. Place the baking tray in the oven, not too high. Let the granola slowly roast. Take out the baking tray every now and then and stir with a wooden spatula to avoid burned parts. Take out when there is a lovely smell in your kitchen and the granola have a beautiful golden color. 5. Let the granola cool off and then add the salt and the grained cardamom. Spread it equally over the nuts and again work with your hands. 6. When cold, pour over in a tin can or a glass bowl with a lid. The granola can be kept up til 4-5 weeks without loosing any taste. 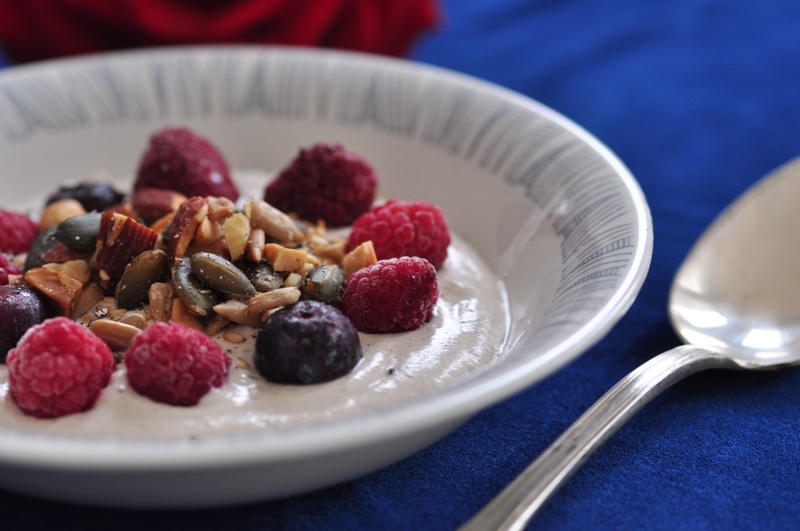 Part from adding it to the cashew yoghurt in the morning, I have also used the granola in both smoothies, healthy bars and cakes when I want something crunchy to go with it. Volgende paginaPumpkin with halloumi, tomato sauce and lots of flavors!